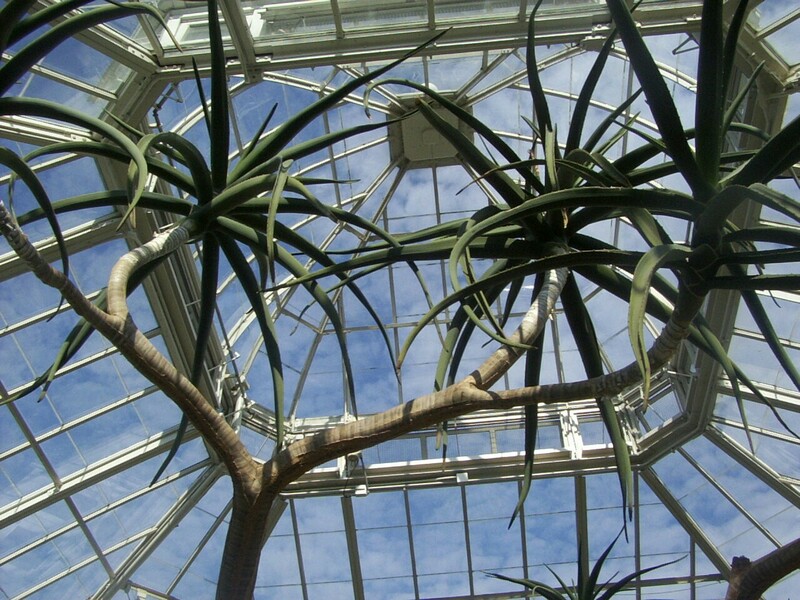 In my very first blog post last month, one of the questions I posed was "Thirty Aloes? How the hell did that happen?" So I thought it was high time I answered it. For years, Aloe was one of those plants that I was distinctly unexcited about. That is because I basically thought Aloe was one of those plants. You know, Aloe vera: dull green, maybe with a few random spots, pointy and bland. (Or at least that is what is typically sold as Aloe vera; I understand there is a case of mistaken identity going on.) I guess I knew in the back of my mind that there were other species around, but I thought they were more of the same. Dull green, pointy and boring. Hah. Twenty-one Aloes enjoying last summer in my backyard. Maybe about five years ago, someone on Garden Web posted a picture of an Aloe with deep green, shiny leaves and a pattern of not quite stripes, not quite spots. I thought it was quite lovely, not boring at all. "That’s an Aloe? Hmm. Maybe there is more to this genus than I thought." A similar species to the one that caught my eye on Garden Web. This might be Aloe harlana, or Aloe hemmingii, or a hybrid, or something else entirely. For some reason that very summer, the box and discount stores in my area were full of interesting aloes. I must have picked up six different varieties at Home Depot alone. This was a true case of wanting the right thing at the right time: I’ve never seen that broad a selection of aloes around here since. It isn’t that I bought everything that they carry and am thus jaded with what is available. It is that they don’t even carry the ones I do have anymore. That same year I also purchased several plants from a couple of local nurseries and on eBay. That year the collector’s fever was truly upon me, similar to what I’ve recounted in my posts about Hedera helix. Once I found out how many varieties there were to be had, I had to have as many as possible. Everywhere I went that sold plants, I looked for a new Aloe. Since then my ardor has cooled; I still like them, and still keep an eye out–but the thrill of the hunt is gone. My experience with Aloes has been very rewarding; I find them to be excellent succulents for those of us who must keep our plants indoors for the winter. They slow down their growth in response to lower light, but they do not take on a leggy appearance, like say, Echeveria (my other favorite succulent genus.) Even if they do stretch out a bit, it is generally not enough to disfigure the plant. Aloe marlothii. This one is actually more ferocious than Aloe ferox, with which it is sometimes confused. This was actually my first Aloe purchase, almost 6 years ago. Even though I likely knew that it was an aloe, I really didn't think of it as one. (I didn't get an actual ID until later.) It was in a two-inch pot when I bought it; now it is almost large enough to sit at the dinner table. Probably my favorite Aloe. I've never been able to get a positive ID, though Aloe sinkatana has been brought up as a possibility. Another NoId favorite, with its summer colors. It reverts to green after some time indoors. Aloe dichotoma. I over watered this one a few winters ago, and the roots and lower stem rotted. I took a stem cutting above the damage, and kept my fingers crossed. It took almost two years, but it finally rooted. 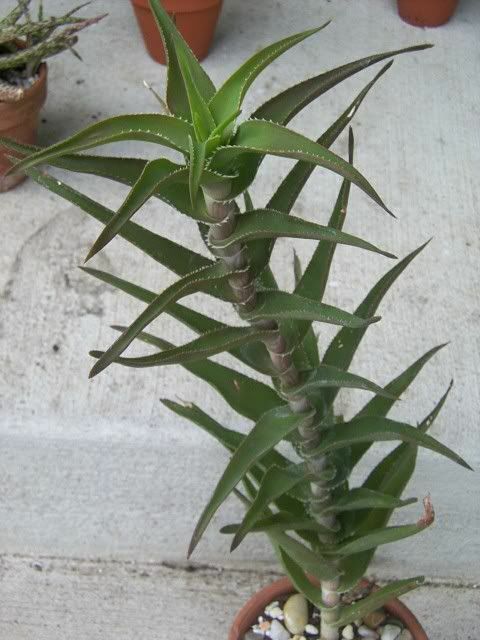 Edited to add 07/31/10: It has been brought to my attention that this is mostly likely Aloe ramosissima, rather than A. dichotoma. Finally, this isn't one of my plants, of course. 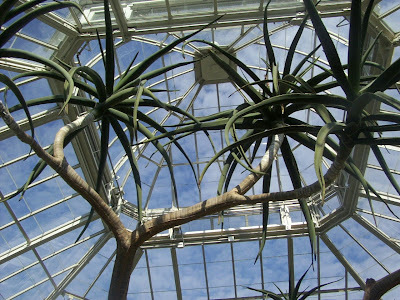 It is a tree-sized Aloe in the collection of the New York Botanical Gardens. I wish I had written down its name. This photograph is from 2003 and is one of my favorites I've ever taken, even though it was done with a rather low-tech camera. As with all the photos it can be clicked for a larger version. 11/18/09 Edited to Add: This is probably Aloe barberae, which is also known as Aloe bainesii. A. congolensis is intriguing. Kind of like A. brevifolia, but more so. Or something. I really like the (possible name?) Aloe harlana; what a lovely plant. I really enjoyed looking at all of your plant pictures, particularly the aloes. I have a large collection of succulents myself, so it's alway neat to see others who like them as I do. If you ever get a chance to buy an Aloe Pilansii, by all means do. This is the rarest of the tree aloes and a wonderful addition to a collection. I love mine. Keep up the great work with the plants! I love your Aloe ciliaris!! !